Best known Taiwanese scholar teaching in national Cheng Chi university applauded the ads (most important ads for Taiwan) for participating in the U.N. (United Nations). This series in recent years are quite old ideas. caption: End political apartheid; sub-caption: A vital life should not be limited, a democratic nation not isolated. ps: Taiwan thinks that political apartheid (like South Africa's old policy) will produce crisis, instead, participation in the U.N. is the solution. (2) The China Times (9/22/'07) comments: a faking issue, on other purposes (United News: purpose to win presidential election). The Liberty Times (9/21/'07): 55% American support Taiwan to join UN. they're " unlimited creative idea!! " ★ (2) Only one witty idea in this fused metaphor ad. 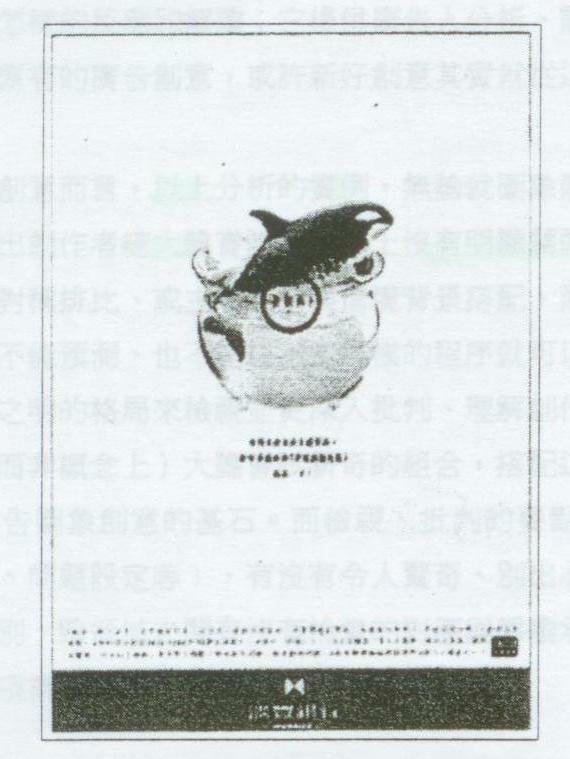 : the shape of whale looks like that of Taiwan, however, the target audiences of the ads., Americans, as well as European people, cannot relish this. Whale is not in top 10 American's favorite animals. ★ (1) opinion : baseball-earth in hand, an old idea !! The art world already got a lot "baseball- earth" designs by graphic fusion or substitution, etc. For instance, political cartoons for the World Series's interrupted by earthquake in S.F, or for environment issue in 1990. You can also see statue art-work as below. Taiwan usually focuses on communications , regardless of (or unable to have) original creativity. So, many of Taiwan's ads are modified or stale stuffs. ★ (2) opinion : earth in hand , it's super-power's image, not Taiwan's. ★ (3) opinion : Taiwan government indicates that it's C. M. Wang's (Yankee's Taiwanese pitcher ) fingers throwing a sinking ball. Using popular star is effective to Taiwanese people. 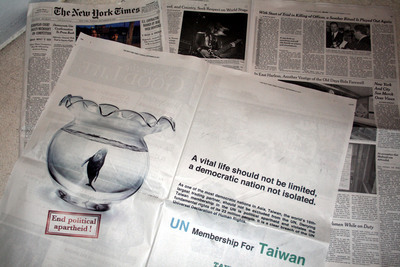 2004-2006 advertisements for Taiwan's participation in U.N.
(1) UNFAIR : the U.N. is un-fair. (1) 2004 Taiwan to UN ads. (2) U.N. is unfair, to reject 23 million people living in Taiwan. Words Play/game is a common design method, like Euro's ad, "I Amsterdam", or Canadian political cartoon "TI'ME", even Yankees fans can designed and showed a sign "TAIWANG" to support Taiwanese pitcher C. M. Wang. (2) UN bring peace: Only the UN can maintain peace in Taiwan Strait. 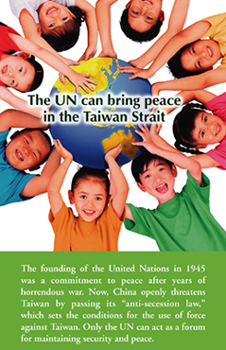 (1) 2005 Taiwan to UN ads. (2) "Feeling": innocent children around the earth, full of peaceful, joyful atmosphere, hints that Taiwan Strait's peace connects Asia's stable status. "Think": Only the UN can bring peace to this area. (3) UNHAPPY:Taiwan is unhappy, in the U.N.'s happy 60th birthday. (1) 2005 Taiwan join UN ads. 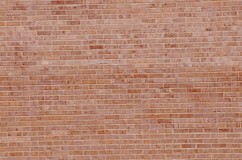 (2) The ad. uses candles with tears, and black & white 60th birthday- cake in shadow, to create sad atmosphere, and to contrast U.N.'s happiness with Taiwan's un-happiness. Sub-caption is "Can a family happy with one member missing?". (1) UN won't be happy without Taiwan? (2) Exactly same idea as an article caption in <The Economist> of 1995, that article mentioned UN received condolences more than congratulations in his 50th birthday. 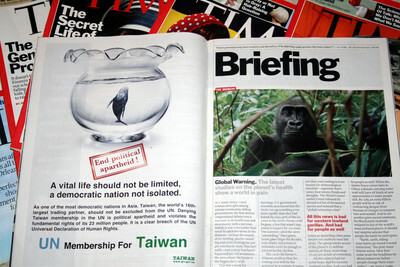 (4) UNhuman Rights (1) 2006 Taiwan to enter UN ads. (2) "To reverse characters" means that it's reverse Human Rights - if U.N. rejects Taiwan's participation. To select human rights as ads. theme is because U.N. just organized a human rights committee in March 2006. (1) Taiwan government said this idea came from a popular film, "The Da Vinci Code". However, "reverse characters" has been used many times , like reverse CITIZEN in Japanese ad., or reverse THINK in western advertisement, etc. (2) Taiwan vs. red China In most cases, using "Two-fers" comparison/contrast advertisement, is a fundamental way to organize information, to get attention, and to be persuasive & effective. This piece is too "simple" or direct, not good enough for high-educational target audiences. the UN series is too old idea !! Media views to Taiwan's participation in the U.N.
(1) <The United News>, <Apple Daily>, <the China Times>: Taiwan's Participation in the UN is a fake issue, on presidential-election winning purpose. (2) <The liberty Times>: To participate in the United Nations is a "target" as well as a "means". Oct 27, '07 Japan's poll (made for Taiwan government): 74% Japanese agree Taiwan should join the UN. Sept. 21, '07 : 55% American support Taiwan to participate in the UN.